New Wi-Fi Network or Equipment? If your Wi-Fi network credentials have changed (Name/SSID and/or password), or you setup a new router from the one you had when you first setup your Rachio, we recommend you perform a Wi-Fi Reset. A Wi-Fi Reset will clear the controller's network settings, but not the zone or schedule settings. Select your controller type below for specific instructions and video guides. From within the Rachio app, navigate to the “More” tab, then select “Controller Settings.” Select “Update Wi-Fi Network” and then follow along with the app’s instructions. In-app instructions will vary slightly for Android users. Press and hold the Wi-Fi button on the controller until the light bar is fully illuminated. A blue flash will indicate the device has accepted the command. The device will provide the shut down light codes and then restart. (When the controller is shutting down, the light bar will start out fully illuminated with a white light. The light will then shrink down to the middle of the bar. It will continue to provide this code until the controller reboots). When quadrant one is solid and quadrant 2 is blinking, complete the Wi-Fi update process from within the Rachio app. The Rachio app will let you know once the Wi-Fi update is successful. From within the Rachio app, navigate to the “More” tab, then select “Controller Settings.” Select “Update Wi-Fi Network” and then follow along with the app’s instructions. Note that instructions will vary slightly for Android users. 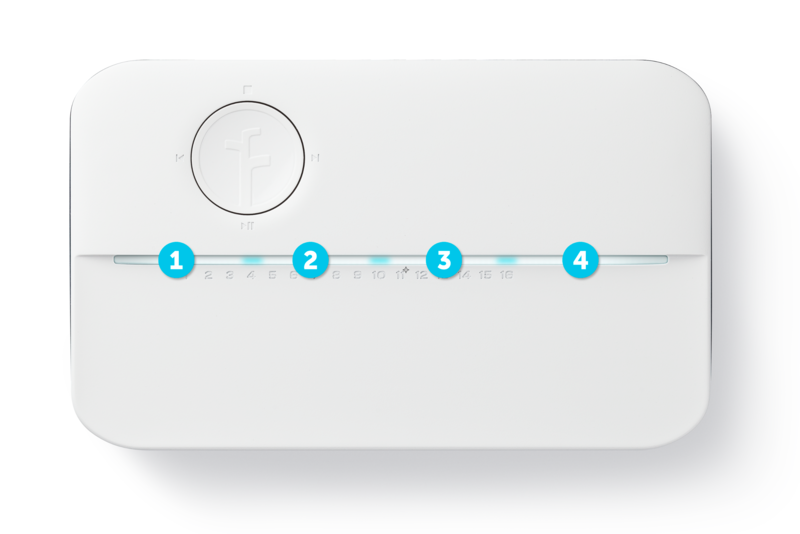 Unplug your Rachio Smart Sprinkler Controller, Generation 2, then plug it back in. Press and hold the DOWN ARROW + SELECT BUTTON (see image below for reference) simultaneously until the LED light ring is fully illuminated, then release. If Light One turns solid before the light ring begins to fill, you will need to reset again by power cycling and holding the buttons. The light ring will fill once more. After light one is solid and light two is blinking, your controller is ready to connect to a Wi-Fi network. This may take several minutes. The Rachio app will let you know once the Wi-Fi update is successful.